Mexico Food – Drinks & More!! Bring salted water to a boil in a large pot. Add half of the large coarsely chopped onion and the two finely diced garlic cloves. If using chuck roast, add the meat and reduce heat to low. Simmer for several hours until tender. Remove the meat, allow it to cool, then shred. If using chicken, add the meat to the boiling water and reduce heat to low. Simmer until just cooked through. Remove the chicken, allow it to cool, then shred. In a heavy-bottomed pot set over medium heat, add oil and saute the sliced onions until softened but not brown. In a blender, combine the chipotle chiles to taste, the adobo sauce from the can, the tomatoes, the remaining half of the chopped onion, the two garlic cloves, chicken bouillon powder, and salt. Puree until smooth. Add the puree to the sauteed onions in the pot and simmer 5 minutes. Add the shredded meat. Stir and cook until heated through, another 5 minutes or so. 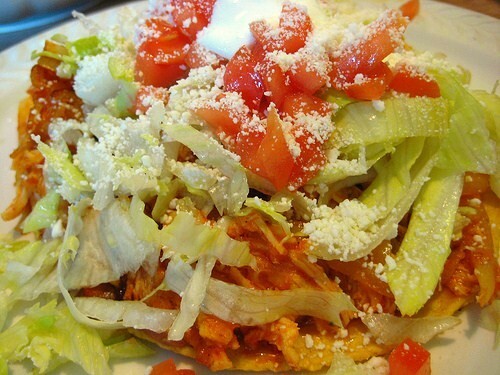 If making tostadas, add some tinga mixture, and top with some lettuce, sour cream, and parmesan cheese. If making quesadillas, add a flour or corn tortilla to a large pan set over medium heat. Flip when hot and add some tinga mixture to half of the tortilla. Fold the tortilla in half. Flip after a minute or so. When hot, remove from pan and add sour cream, parmesan, and avocado salsa. This entry is filed under Chicken. You can follow any responses to this entry through the RSS 2.0 feed. You can leave a response, or trackback from your own site.